After terror mastermind behind massive 2008 terror attacks in India given bail, government prosecutor preps to challenge ruling. A Pakistani government prosecutor said Friday he will challenge a court order granting bail to the man accused of masterminding the 2008 terror attacks in Mumbai. A judge in an Islamabad anti-terror court granted bail on Thursday to Zaki-ur-Rehman Lakhvi, charged with being the mastermind of the siege on India's commercial capital that left 166 people dead. The court order drew swift condemnation from India, which urged the Pakistani government to appeal. 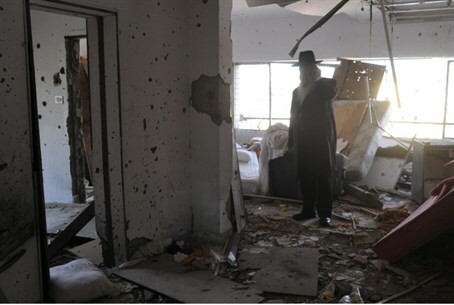 One of the several high-profile targets assaulted by the gunmen was the Chabad House in south Mumbai, where the directors Rabbi Gavriel Holtzberg hy''d and his pregnant wife Rivky hy''d were among the six murdered. "I am completing all the legal formalities and then I will challenge this order in Islamabad on Monday," government prosecutor Mohammad Azhar Chaudhry told AFP. The banned Pakistani terrorist group Lashkar-e-Taiba (LeT) was charged with being responsible for the 60-hour assault on Mumbai. Relations between the two nuclear-armed rivals worsened dramatically after the carnage, in which ten gunmen attacked luxury hotels, a popular cafe, a train station and the Chabad center. Lakhvi remained in the high security Adyala prison in garrison city of Rawalpindi even after Thursday's court ruling. "Today I am trying to get a copy of the written (bail) order and then I will file an appeal in Islamabad high court," Chaudhry said. The court's ruling on Thursday came a day after Pakistani Prime Minister Nawaz Sharif vowed to crack down on terror groups in Pakistan, after Taliban gunmen massacred 148 people, mostly teenagers, at a school. Sharif on Wednesday announced that a six-year moratorium on the death penalty would be lifted for those convicted of terror offenses. Indian Home Minister Rajnath Singh had said granting the bail was "very unfortunate," adding "India has given enough evidence (against Lakhvi). We expect the Pakistan government to appeal at the earliest." The horror of the Mumbai carnage played out on live television around the world, as commandos battled the heavily-armed gunmen, who arrived by sea on the evening of November 26, 2008. It took the authorities three days to regain full control of the city and New Delhi has long said there is evidence that "official agencies" in Pakistan were involved in plotting the attack. Islamabad denies the charge but LeT's charitable arm Jamaat-ud-Dawa (JuD), seen as a front for the militant group, operates openly in the country. LeT founder Hafiz Saeed also leads a high-profile existence despite a $10 million US government bounty offered for his capture, regularly appearing on TV and addressing large public gatherings of his followers. Seven Pakistani suspects have been charged with planning and financing the attacks but the failure to advance their trials has been a major obstacle to normalizing ties between Pakistan and India. Delhi has accused Islamabad of prevaricating over the trials, while Pakistan has claimed India failed to hand over crucial evidence.